Despite being parodied several times in the Scary Movie franchise, and with Scream 3 becoming everything the series stood against, Scream 4 [or SCRE4M, as it’s snazzily styled in the film] has come to our screens with guts and gore, and just a little bit more. Those who have seen the first Scream films will remember that they gained cult-status from standing out from the crowd, and having more character development, and more of a plot line than several other co-existing films within the horror genre [a point that is again stressed in the first few minutes of this film, where a character launches a scathing attack on the recently-deceased Saw series. Admittedly she gets stabbed to death by the usually-angellic Kristen Bell a second after, but she makes a valid point nonetheless]. The film begins in its usual way, warming up [or should I say chilling?] the atmosphere and getting the blood flowing with a few gory murders; all of which seem to feature blonde, stereotypical horror-victims; another scathing attack on the horror genre and its little quirks. From then on, the film gets into gear. For a franchise that was once famed for having thick, moving plotlines, this flick certainly does not disappoint. The cast doesn’t exactly make for a downturn, either, with Neve Campbell, Courtney Cox, and David Arquette reprising their roles from the earlier movies. Campbell and Cox throw in sterling performances, both play feisty females on the run, and on the hunt, for the killer. David Arquette, however, seems to be quite disappointing. From an audience member’s point of view, it seems as though a wooden plank could have played the part of Sheriff Dewey Riley with more confidence. Arquette was trying to play the part of the bumbling Sheriff, but could only manage to play the bumbling actor playing the bumbling Sheriff. Newcomer and youngster Emma Roberts [who, according to several sources, auditioned for director Wes Craven via Skype] performed well for around 80% of the film; with her portrayal at the end becoming little more than weak, and fodder for laughter in the cinema. There was also solid supporting roles played by once-Heroes actress Hayden Panettiere, and a bit of hit-and-miss acting from Rory Culkin [yes, that is Macaulay’s brother]. Although the film does have a strong plotline, most of it seems to be based around call-backs from the old Scream movies, with some killing and action scenes almost becoming exact replications of the ones that adorned the celluloid of the past flicks. However, one thing they forgot to replicate is the tension of the killing- old Scream movies used to have the audience on the edge of their seats, willing the victim on to try and find a way out. This film has lost that tense side to it, becoming a 60% mind-numbingly boring blood-fest. At the same time, drama-fans will probably only find around half an hour of the film watchable- where the middle-to-latter part of the film includes more plot-twists than you can shake a stick at, in an almost “Shutter Island” sort of way [though, this won’t make you anywhere near as loopy]. Ghostface obviously makes a return in this sequel, however, most of the film is spent watching him mindlessly cut people open with the skill of a back-street surgeon, rather than provoking any thought as to who might be under his infamous mask. 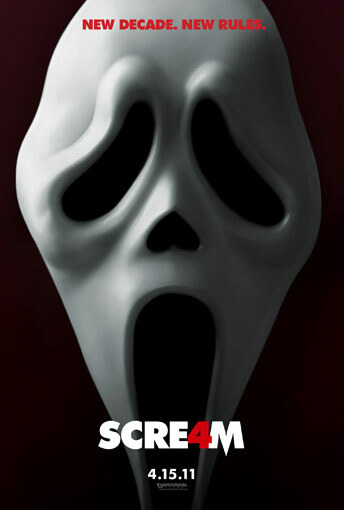 Whilst Scream 4 has some very clever and snappy dialogue, and also some very intelligent callbacks that will no-doubt please fans of both the genre and the series, it seems to be hoist by its own petard- overthink this movie, and you’ll suddenly find various plotholes and mistakes that will make you question how much Scream stands out from the rest of the genre in the first place. Overall, what was a good series in films 1 and 2 (and pretty much ruined in 3), has started its resurgence, and with talk of this film being the first in another trilogy, one can only hope that they get quite a bit better than this. Oh, and that they find a way to fire Arquette. All in all, a medicore film- some good plot and action that is ruined by most of the footage being a gorefest. Reviews arquette, courtney cox, Film review, horror, movie, movie review, scream, Wes Craven.